With the release of Iron Cross, there are a variety of new formations available for German players from Grenadier Companies to Panzergrenadier Companies. 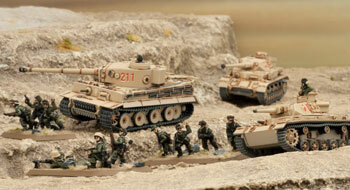 Now these formations aren’t just limited to service on the Eastern Front and can be used to represent German forces fighting in Tunisia in 1942 and 1943, allowing you to take your Eastern Front force on an African vacation or to build a force specially designed and modelled for service in Tunisia. In November of 1942, the Axis situation in North Africa was dire as Rommel’s advance into Egypt had been stopped and the Afrika Korps had been then forced to withdraw after the battles of El Alamein. Pursued by the British Eighth Army, Rommel managed to withdraw the remnants of the Afrika Korps, but this retreat had left most of Italian Libya under British control. The situation facing the Axis worsened drastically following Operation Torch, in which a joint Anglo-American force invaded Morocco and Algeria, threatening to occupy Tunisia. In response, the Germans and Italians sent as many troops as they could spare to the city of Tunis, hoping to be able to secure Tunisia quickly and to therefore prevent the Allies from capturing the entirety of French North Africa without a fight. 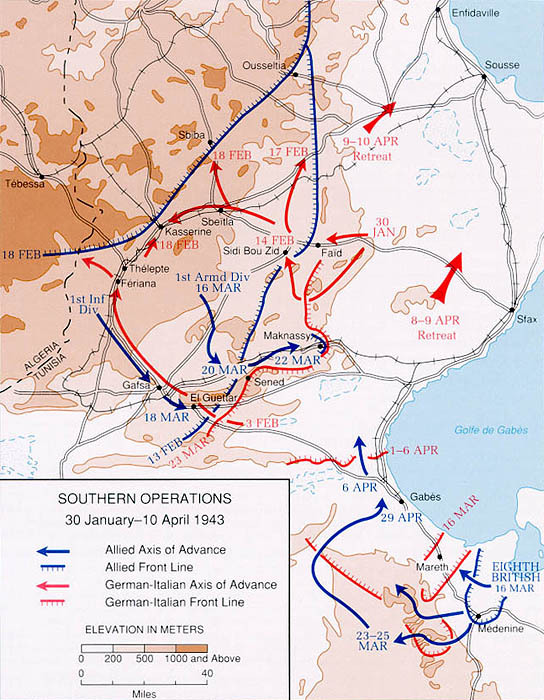 The forces which were rushed to Tunisia consisted of a variety of formations which were organised for service on the Eastern Front and therefore significantly differed in both their organisation and equipment to the forces which were previously available to the Afrika Korps in North Africa. The soldiers of the Grenadier Companies in Tunisia can be represented by using the new Grenadier Company Formation available in Iron Cross, which is significantly different to the Afrika Rifle Company available in Afrika Korps. The Grenadier Platoons which make up the compulsory choices of a Grenadier Company are larger than the Afrika Rifle Platoons available to the Afrika Korps, with a maximum size of 9 MG34 and K98 Rifle teams backed up by a 2.8cm anti-tank rifle team and 2 SMG34 HMG teams. These significantly larger platoons will lend your forces added survivability, enabling them to hang on longer when dug in on the defence and to be a more pressing threat when advancing against your opponents. The Grenadiers also have access to a variety of platoons not available to their comrades in North Africa, such as the entire platoons of heavy machine guns which are ideal for defending objectives or the ubiquitous 8cm mortar, which provides your troops with a cheap artillery option suitable for both thinning out enemy defenders or attacking enemy artillery. A few weapons not previously available to North African forces are also present in the Grenadier Company, in the form of 7.5cm and 15cm infantry guns, multipurpose artillery pieces capable of both indirect and direct fire, which offer your Grenadiers additional flexibility as well as a limited degree of anti-tank firepower. Another new option which is unique to the Grenadiers in Iron Cross is a sniper, whose skilful use of cover and accurate fire can harass and pin down enemy infantry. A further option for Grenadiers in Iron Cross is to upgrade them to Pioneers using the Pioneer Company command card. This enables you to field the tough combat engineers of the Wehrmacht, who were often tasked with assaulting enemy fortifications and preparing defensive positions. Pioneer platoons are able to cross minefields more easily and dig in more reliably, making them a nasty surprise for an opponent who thinks their objectives are safe behind a minefield. When the Allied naval landings of Operation Torch threatened the Axis position in Tunisia, the Germans reacted by gathering any troops they could spare and forming them into scratch formations called Marschbataillonen, which would then be deployed to Tunisia. These formations consisted of trained soldiers, though the rapid formation of these battalions undermined the unit cohesion of the Marschkompanies and as a result their combat effectiveness suffered. Although there is not an explicit Marschkompanie formation in Iron Cross, the new Luftwaffe Field Company command card provides an alternative way of representing the reduced combat effectiveness of the Marschkompanies in Tunisia. By using command cards in this manner, you can represent specific units or formations by thinking outside the box where an official formation does not exist. The Panzergrenadiers of the Panzer Divisions which fought in Tunisia also have a different organisational structure to the Rifle Company found in Afrika Korps. Panzergrenadier platoons of a Panzergrenadier Company boast significant firepower, consisting of up to 7 MG34 teams with the option of a 2.8cm anti-tank rifle and can put out a total of 21 dice worth of machine gun shots at enemy unfortunate enough to become a target. 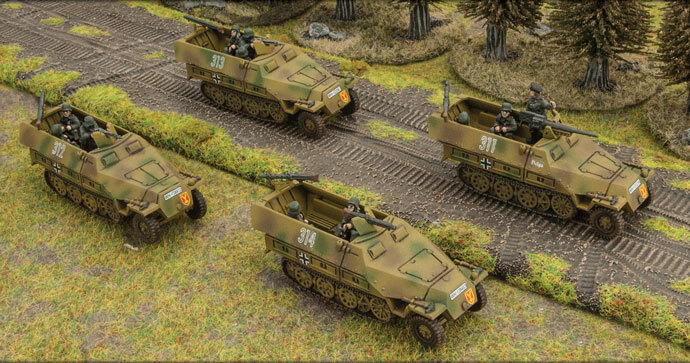 A Panzergrenadier Company also has access to several of the same core platoon options as the aforementioned Grenadiers, such as 7.5cm and 15cm infantry guns and heavy machine gun platoons. The Panzergrenadiers also have access to 8cm mortars, though only in the form of a mortar section, which has only two mortars compared to the six which can be taken by Grenadiers. The German forces deployed in Tunisia were also armed with a variety of new weapons which had not previously seen combat in the deserts of North Africa such as the 7.5cm PaK 40 anti-tank gun, the 15cm Nebelwerfer Rocket Launcher and the StuG with a long 7.5cm gun. The PaK 40 is a significant upgrade over the PaK 38 which was used by the Afrika Korps, boasting an anti-tank value of 12, enough to penetrate the thick armour of a Sherman or Churchill tank. Although not as powerful as the 8.8cm anti-aircraft guns which wreaked a dreadful toll on allied armour in the desert, the PaK 40 is significantly smaller and easier to conceal than the 8.8cm gun. The PaK 40’s smaller size grants it a 3+ save as well the ability to be placed from ambush closer to enemy units than an 8.8cm gun can, making the PaK 40 both more survivable and more capable of ambushing enemy units. Another new option is the 15cm Nebelwerfer, a multiple rocket launcher which developed a fearsome reputation among allied servicemen in Tunisia, as well as the nickname “Moaning Minnie” due to the screaming noise its rockets made when fired. The Nebelwerfer offers an alternative to the 10.5 cm howitzer, and it is superb at digging out enemy infantry and guns due to its decent firepower value as well as its salvo template, which covers an area much larger than a normal artillery bombardment. An uncommon sight on the Tunisian battlefields were the four StuG assault guns of StuG Battery 90, which were armed with long 7.5cm guns and fought as part of 10th Panzer Division. Now Iron Cross allows you to use these assault guns as part of your force giving your troops a flexible armoured vehicle capable of taking on both enemy tanks and infantry as well as a unique flavour due to the inclusion of a vehicle which was so rare in the African theatre. Finally, Iron Cross allows you to field one compulsory unit from an Italian Formation and one Italian Formation as allies fighting alongside your German troops. This enables you to supplement your German forces with new capabilities, such as the flexibility provided by Semovente assault guns, the numbers offered by cheap M14/41 tanks or the defensive capabilities of a Weapons Company. Furthermore, you could use an allied Italian Bersaglieri Infantry Company supporting a German Grenadier Company or a Marschkompanie to represent the unique Division von Broich/von Manteuffel, which included Bergsaglieri Regiment 10 as a component of the division, which was rather unusual as the rest of the division consisted of German troops. The half-track played an important role in the blitzkrieg campaigns from the Russia Steppe to the wadis of Tunisia. 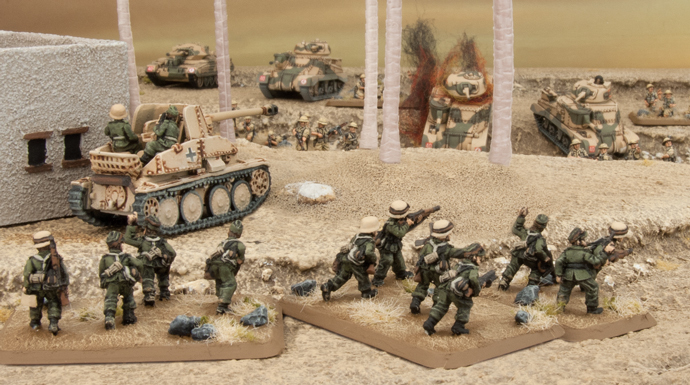 When we designed Iron Cross and Ghost Panzers, the armoured panzergrenadiers fell into the Kursk bucket, but until that book hits the shelves, we wanted to make sure that you could still use them with your Iron Cross panzergrenadiers. To that end we've provided the rules to field the Sd Kfz 251 with Iron Cross. Check out the link below for more information.